So, I thought I’d start a new tradition of periodically jotting down those gadgets that have me chomping at the bit to spend money I probably shouldn’t spend. These are the ones that some might call obsessions–although I subscribe to the theory that my brain simply likes shiny new gadgets to play with, and some things are shinier than others. Right now, these are the shiniest. I think it’s been obvious from some recent posts that I’m a little, shall we say, interested in Samsung’s near-vaporware hybrid Windows 8/Android machine, the ATIV Q. The idea of a single machine that can serve as both my Android tablet and my Windows 8 notebook is very compelling–today, I’m constantly switching back and forth from my Nexus 10 to my MacBook Air as I’m researching, keeping up with the news, playing casual games (the only ones I have time for), writing, and doing other productive tasks. That’s a pain, especially when I’m in one room using the tablet (I tend to carry it around with me far more often) and the MacBook Air is in another, and I get a writing idea that needs to be put down. A virtual keyboard is okay for a few sentences, but anything more than that demands a real keyboard. So, although it’s good for my health to move around more often, sometimes it’s just a bother. 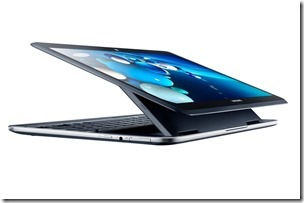 Of course, we’re stuck in limbo as far as the ATIV Q’s actual release (or potential cancellation) goes. Rumor has it that we’ll hear more at the IFA conference starting on September 6 in Berlin, with perhaps a redesigned pre-production machine to be shown off. If the rumored patent issues are true, then perhaps the redesign is to get around the patents. Some folks who are disappointed with the 4GB of RAM hope that Samsung will be showing of a device with 8GB. We can dream, right? As I’ve used Windows 8, I’ve enjoyed it, but don’t yet see a need for dedicated Windows 8 tablet, or even a Windows 8 hybrid. The new OS runs perfectly fine in Parallels on my MacBook Air. There’s no touchscreen, of course, but I’ve found Windows 8 gestures on a good touchpad to be comfortable and efficient. 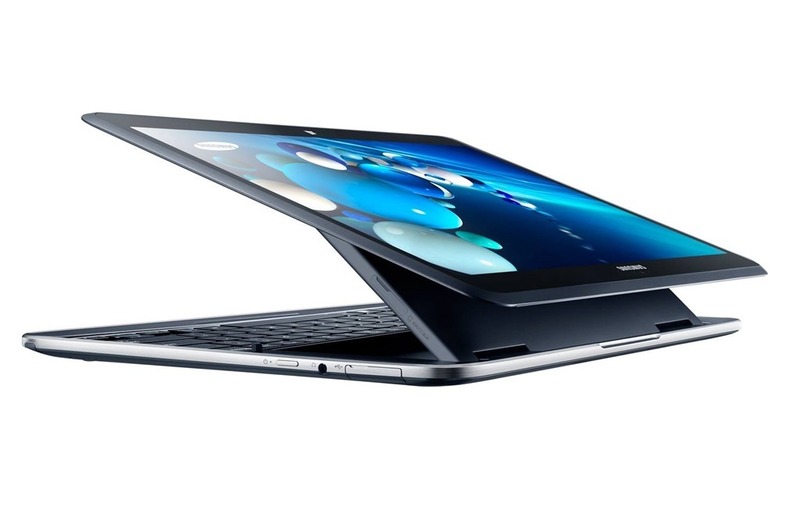 Therefore, it’s only the addition of Android that makes the ATIV Q so attractive to me–with a 3200X1800 13.3″ screen (275 PPI), the ATIV Q is thin and light enough to be an excellent semi-mobile Android tablet while also being a perfectly serviceable Windows 8 machine. I’ll buy one the second it’s released, even with 4GB of RAM. My analog watch broke a number of months ago, and I haven’t yet replaced it. I do like having a watch, though. Pulling my cell phone out of my pocket to check the time is a pain. I don’t like very cheap watches, and so I’d be likely to spend at least $250, and probably more, if I were buy a new analog watch today. Fortunately, the geek in me is lucky to have a few upcoming options in the smartwatch category. For me, a smartwatch could be quite valuable, allowing me to easily check the time as I do with an analog watch, while also having access to some subset of functionality provided by my smartphone. The options vary greatly depending on which smartwatch we’re looking at, from those that are mere extensions of a smartwatch and do almost nothing when disconnected, to those that can run their own internal apps separately from a smartphone, to those that are “smartphones” on their own by virtue of having their own cellular radios. Personally, all I really want is a smartwatch that will always tell the time and date regardless of connection status, and then when connected will allow me to see SMS messages, screen phone calls, control a music player, and other functions that don’t require data input. If a smartwatch minimizes the number of times I need to pull my smartphone out of my pocket, then it’s a win. A smartwatch that maintained some of this data, such as past messages and call status, then that would be gravy. I’ll also mention what I don’t care for: even the option to talk to my smartwatch. While I’ve found voice input valuable in some instances on my Nexus 4. such as when driving, I don’t believe (or hope) we’ll ever get to the point where talking to a device is commonplace in any public or social environment. I wouldn’t talk to my smartphone in the office, for instance. With 10 people or more working within earshot, imagine how ridiculous it would be if everyone were commanding their smartphone (or notebook, or tablet, or smartwatch) this way. I’ve never been a big believer in, or supporter of, ubiquitous voice input as a way of controlling a personal device. Indeed, I think the next step beyond keyboard- or touch-based input will be some kind of direct connection to the brain. I don’t think it will be voice or even gestures–those are also ridiculous on personal devices a group setting. 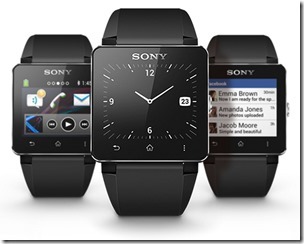 Two upcoming devices of interest are the Samsung Galaxy Gear, if it works with non-Samsung smartphones, and the Sony Smartwatch 2. The former will be announced on September 4, while the latter has already been announced and should release sometime during Steptember. I don’t hold out much hope that the Gear won’t be Samsung-specific, and so it’s the Sony that I’m planning to purchase whenever it’s released. The original Sony smartwatch was flawed, and it looks like the Smartwatch 2 should resolve many of the original’s issues. The second version will have a bright LCD screen that’s easier to view in sunlight (a requirement for a smartwatch, I think), NFC for easier pairing, water resistance, and generally improved functionality. 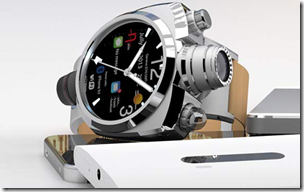 On paper, at least, it looks to do everything I want a smartwatch to do, and nothing more. I should note that throughout this discussion, I’ve talked about pairing with a smartphone. I’m also interested in how a smartphone pairs and works with tablets. I often use my tablet more throughout the workday than my smartphone, and so a smartwatch that works well with my tablet would be most welcome. Regarding the rest of the field, such as the Pebble and various kickstarter phones, I’m not terribly interested. The Pebble seems too limited to me, and I don’t consider a kickstarter product to be real until it hits the streets. 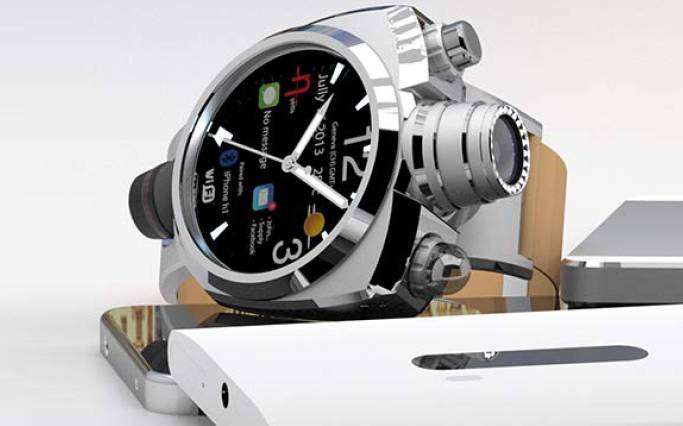 There’s one smartwatch that’s available for preorder, the Hyetis Crossbow, that’s a geek’s dream, combing an analog watch with a smartwatch. It’s also $1,200 and gaudy as hell. If I had $1,200 to spend on a smartwatch, I’d buy this one just for the geek factor–I can’t image a more powerful statement about my geekiness than slapping this monster on my wrist. Of course, I don’t have the required $1,200, and I’d love to see Hyetis release a more limited device–just drop the 41MP camera and the device would already be far more elegant and probably considerably less costly. Note: As I’m writing this, some images that allege to show the Samsung Galaxy Gear have popped up. I must say, if this is what it looks like (check out the link, seriously), I’m not interested in it whether it connects to non-Samsung smartphones or not. To me, that’s one ugly, unwieldy beast. And incidentally, I’m not at all interested in having a camera in my smartwatch. I like my Nexus 4, for the most part. In fact, it’s the best smartphone I’ve owned to date. If it weren’t for the subpar camera, I wouldn’t be waiting with bated breath for the next Nexus. Problem is, I just can’t seem to take a really good picture with the Nexus 4, no matter how I try. Oh, I admit, every now and then I’ll get a decent shot, but it’s pretty much random. It’s my hope that whatever Google releases as the next in the Nexus line, it will have a dramatically improved camera. Really, I’d be happy with the same device as the Nexus 4 but with a better camera. I’m sure other specs will be upgraded as well, but if the camera’s lackluster, I’ll stick with my Nexus 4. As of right now, that’s it for my list of gadgets that I’m currently lusting over. I’m hoping to have the Sony Smartwatch 2 on my wrist by the middle of September (rumor has it releasing on September 9), and if we don’t hear more about the ATIV Q at IFA this week then I’ll assume that it’s dead for the time being. Finally, the Nexus 4’s replacement could be announced as soon as October. So, I shouldn’t have too long to wait for any of the items on my list. Let me know in the comments what gadgets you’re lusting after.